Throughout the summer months in Jackson, MO, the Jackson Municipal Band plays free weekly concerts every Thursday evening and performs throughout the year at important community events such as Memorial Day, the Fourth of July and Homecoming. Ensuring that the band sounds better than ever for its ninety-second season, locally based systems integrator Unity Pro Audio and Video upgraded the Jackson Municipal Bandshell in City Park with the installation of a six-cabinet QSC Audio WL3082-wx Weatherized WideLine-8 line array loudspeaker system powered by three PowerLight 3 Series amplifiers. 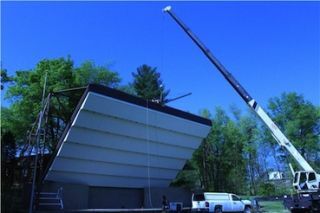 The Jackson Municipal Band has been performing annually since 1976 at the outdoor bandshell, which is located in a grassy amphitheater bordered by trees, but until now has not had a purpose-designed PA system. “They were using point and shoot speakers. The community approached us to be a little bit more creative and push the envelope of technology a little; they knew that is our forte,” said Unity Pro AV’s Matt Schwartz, who mapped the location into EASE Focus and designed a system that he then presented to the board of directors of the community band. Schwartz determined that the best solution for the bandshell, which is approximately 50 feet wide, was a center array with a wide dispersion pattern, and then selected the QSC Weatherized WideLine Line Array Loudspeaker system, citing its ample coverage and affordable price point. Two QSC PL380 amplifiers (2 x 2500 W @ 4 ohms) and a single PL340 (2 x 1250 W @ 4 ohms) power the array, which is optimized using an SC28 System Controller. Unity Pro AV additionally supplied eight QSC K10 two-way, 10-inch active speakers for use as floor monitors.